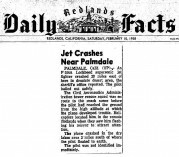 Crashed after take-off from Lockheed Plant42 Palmdale, California. The aircraft did not gain altitude and crashed into Quarz Hill. 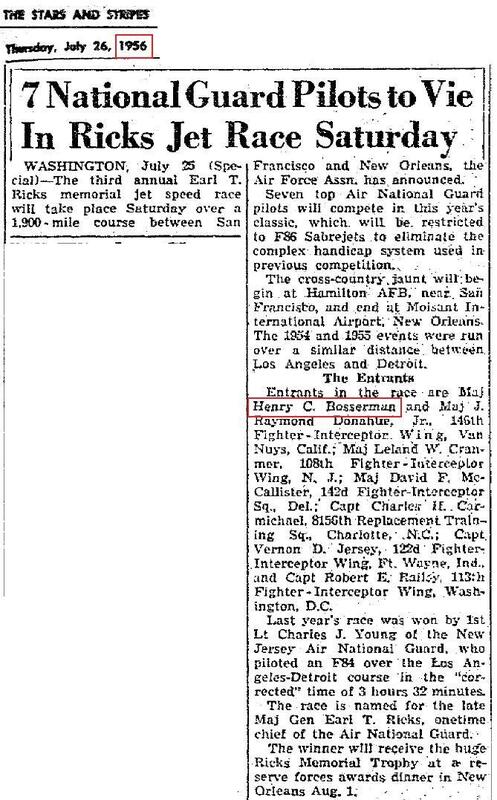 Pilot (Lockheed chief testpilot) Henry Bosserman (35) ejected but was sadly killed. The aircraft was too low for his parachute to open and he did not survive. It happened during production flight (pre delivery testflight) at taking off 8:03 AM. The airplane crashed in an open area in the Quartz Hill section near Avenue M and 27th Street about 4 miles west of the airport. A helicopter located Bosserman’s body near 16th Street and Avenue M, east of the crash. Witnesses stated that they saw the aircraft flame-out and possibly break in half shortly after taking off. They also said the plane developed excessive vibration in its engine before it plunged to earth. The F-104A crashed in an open area near a house in the Quartz Hill section 4 miles west of Palmdale Airport. 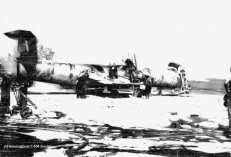 Bosserman’s body landed nine blocks from the main wreckage. 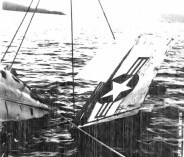 Wreckage was scattered over a wide area and some landed in the yards of nearby dwellings. A very sad story indeed. Beneath some new paper reports about the accident (thanks to Chris Baird). Click on them to read them. Written off after an accident 35 miles E of Palmdale, California. It happened during a routine production testflight, prior to delivery to the USAF, so still property of Lockheed itself. 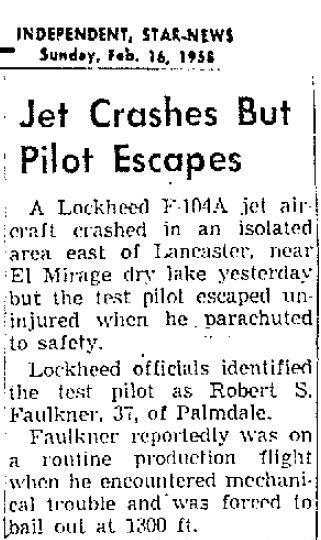 The pilot, Lockheed testpilot Robert S. Faulkner (37) survived the accident by succesful use of his ejection seat. The aircraft apparently encountered engine trouble from flameout. The airplane crashed in an isolated, desert area east of Lancaster, California near El Mirage dry lake (23 miles east of Palmdale). 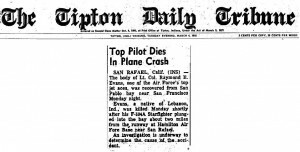 The tower rescue squad was en route to the crash scene before the pilot had reached the ground from the high altitude at which the plane developed trouble. Helicopters located him in the remote flatlands when they saw him flashing his mirror to attract attention. The plane crashed in the dry lakes area 2 miles south of where the pilot floated to earth.. Faulkner parachuted from about 13,000 feet. Beneath some new paper reports about the accident (thanks to Chris Baird). Click on them to read them. Written off after an accident at Hamilton AFB, Calif. The 83 FiS squadron commander LtCol. 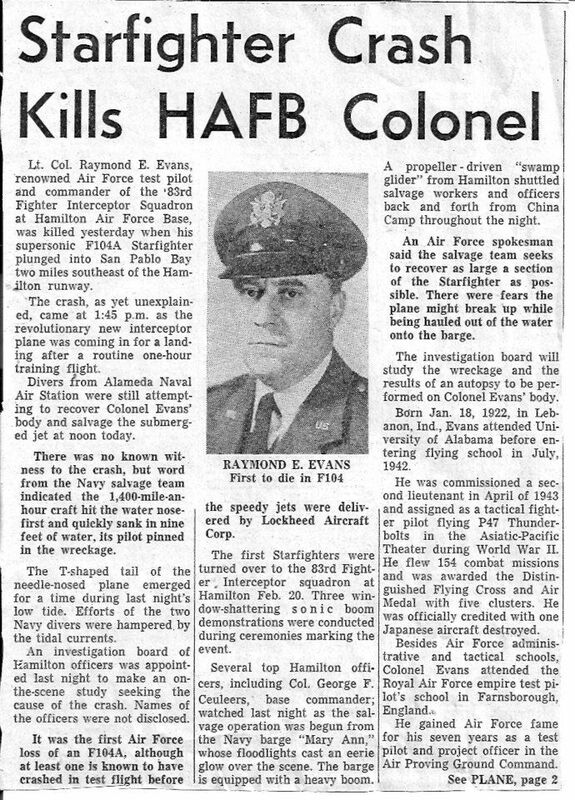 Raymond E. Evans (36) was sadly killed. It crashed on final approach at Hamilton AFB 2 miles short on final into the San Pablo Bay when his engine quit (after encountering excessive engine vibration) on a GCA final, he did not eject. With downward ejection, he had no chance. The F-104A departed Hamilton AFB at 1243 local time on a simulated instrument procedures mission. Once airborne the pilot was not able to work with GCI due to an inoperative IFF. At 1326 he was cleared to descend from 18,000’ to 4,000’ inbound on the 340 degree radial of Hamilton TVOR. Weather was 2,100 scattered, 4,000 scattered, high broken, visibility 25 miles with the wind from 060 degrees at 20 knots. Everything was normal throughout penetration and GCA pattern until turn onto final approach. After performing final cockpit check on the base leg, and while turning from a 280 degree dogleg to final approach, the pilot overshot the GCA centerline slightly due to a strong tailwind on base leg. The aircraft was turned onto final approach heading 300 degrees at 1,500’ approximately 5-3/4 miles from touchdown. The glide path was intercepted at 4-3/4 miles and the pilot instructed to set up his rate of descent. Almost immediately he began a rapid rate of descent below the glide path. The final controller advised the pilot that he was going extremely low on glide path, and to pull up and execute a missed approach. The rapid rate of descent continued and the F-104 disappeared from the radar scope at an indicated point 3 miles from touchdown at 1345 time. The GCA controller advised two other F-104s in the pattern to make a visual check of the final approach to try to locate the lost aircraft. The pilots reported an oil slick on the surface of the bay and what appeared to be the tip of the tail protruding above the surface of the water. The pilot was killed with no attempt to eject (downward operating). 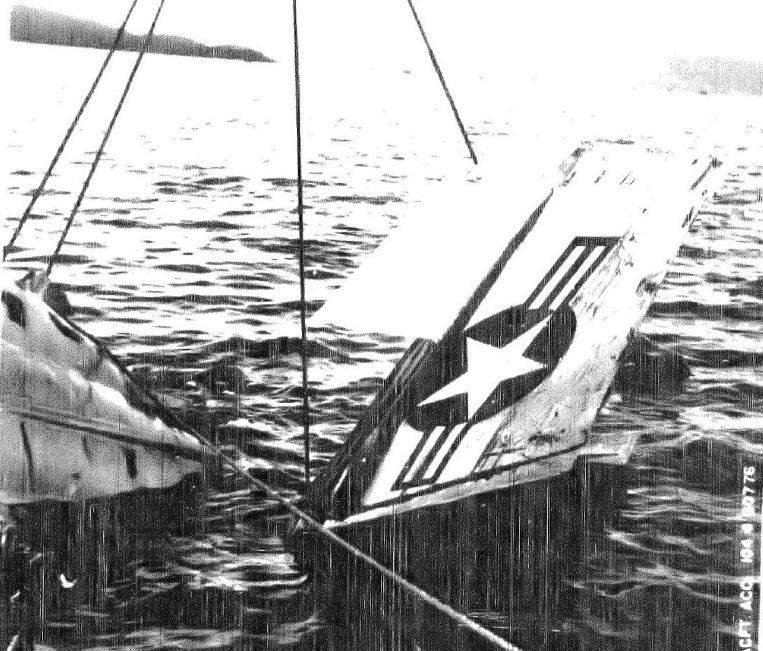 He was recovered from the cockpit in about 10 feet of water. 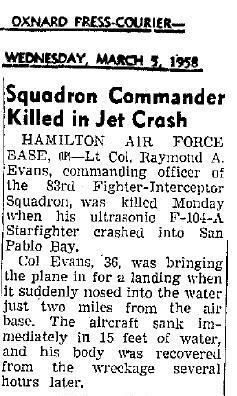 The crash occurred in San Pablo Bay, 3-1/4 miles ESE of Hamilton AFB, California. 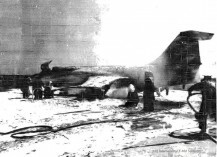 Hamilton’s F-104s were grounded for approximately 7 weeks following this accident. 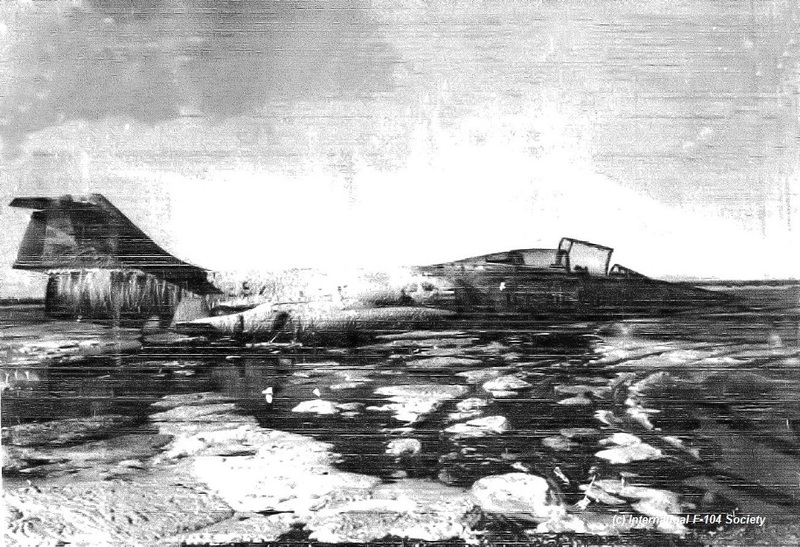 This was the first operational loss of an F-104. 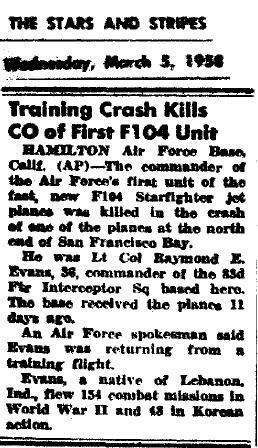 Hamilton had received the F-104s just 11 days prior. Colonel Evans had flown 154 combat missions in WWII and 48 F-86 combat missions in the Korean War. He was also a test pilot. The IFS owns a copy of the official accident report. Beneath a rough photo from the accident report, an aircraft damage scheme and also quite a lot of new paper reports about the accident (thanks to Chris Baird). Click on them to read them. This aircraft crashed 11:30 MST, after take off from Kirtland AFB near Bernalillo, Albuquerque, 10 miles SE of Kirtland AFB. It was on loan by Convair (From the AMC) to use it for chaseflights, likely for the F-106 or B-58 testprogram. This accident also happened during such a 55 minutes scheduled chase flight. The civil pilot Frederic Joseph Voorhies ejected and was safe. Throughout the primary chase mission Mr Voorhies noticed an enginevibration. After that mission the vibration was not noticed and he was joined by Capt Bruce in F-104A 56-739 for the returnflight to Kirtland. At approx. 20,000ft MSL over Kirtland Mr Voorhies noticed a 6 PSI oil indication. The aircraft was then turned and headed towards the approach end of runway 26, to attempt a flameout pattern. He dropped speedbrakes and set takeoff flaps. 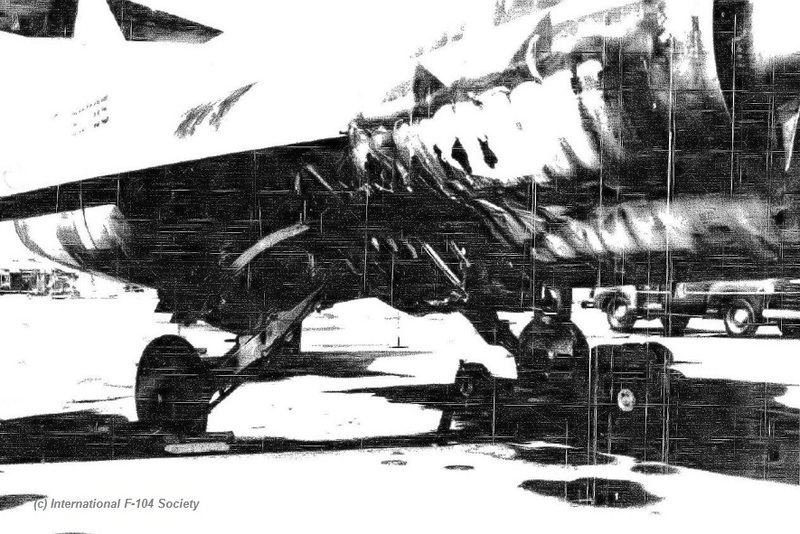 About a minute after the low oil pressure, Capt Bruce saw smoke coming from the back of 56-738. At that point a flame-out occurred with a total loss of the electrical equipment. As he approached the low key point he judged that he was too low and headed the aircraft south east towards an open area to eject from the F-104. About 27 seconds after flame out Mr Voorhies ejected above 5700 feet. and was safe. 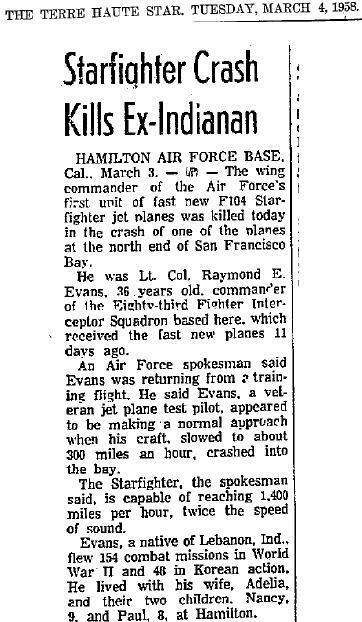 On this day it was reported to have encountered an accident at Hamilton AFB. It had been damaged but could be repaired lateron. 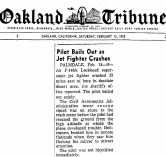 Pilot was "Scrappy" Johnson (Temporary Squadron Commander) and he could step out unhurt. He made a precautionary landing right after take-off at Hamilton AFB due to a fire warning light. He came out of afterburner, and made a closed pattern and landed. At that time he thought it was a faulty fire warning light. He just landed, shut down the engine on the runway and climbed out and walked around the aircraft. Back at the tail section there was a hole burnt in the fuselage. It was later told that one of the spray bars on the AB was pointed out instead of in. 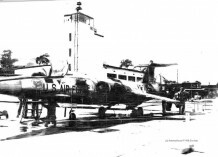 The aircraft was repaired and was even transferred to the Pakistan Air Force in the 60s. 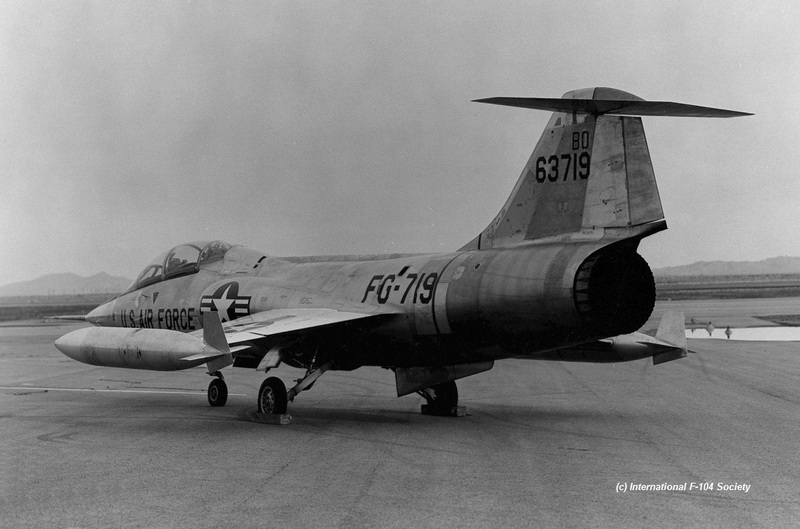 This first build two-seater (still officially designated JF-104B) was written off after an accident at Palmdale. 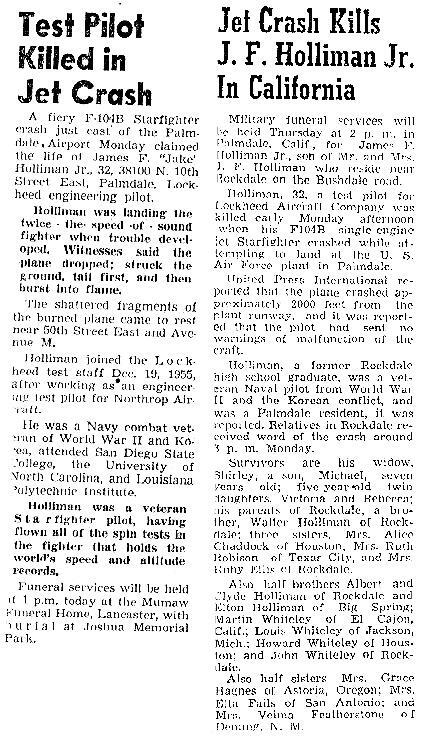 Engineering Lockheed test pilot James "Jake" Holliman JR (Lockheed Aircraft Corp. Test Pilot) was sadly killed. 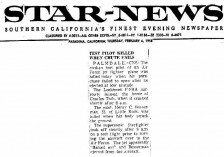 "The accident occurred on final approach at Palmdale when power was lost due to an un-commanded tailpipe suddenly opening up causing a loss of thrust. 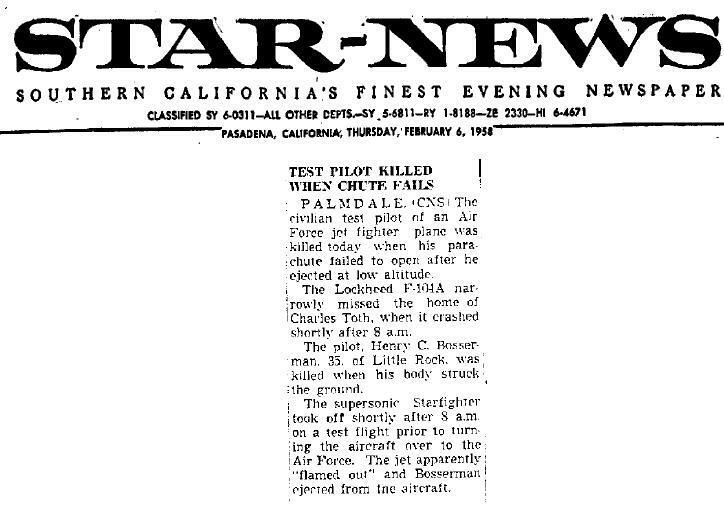 It happened after it departed Runway 25 (Mission "X-1") at Air Force Plant 42, Palmdale, California, at 0955 PST. 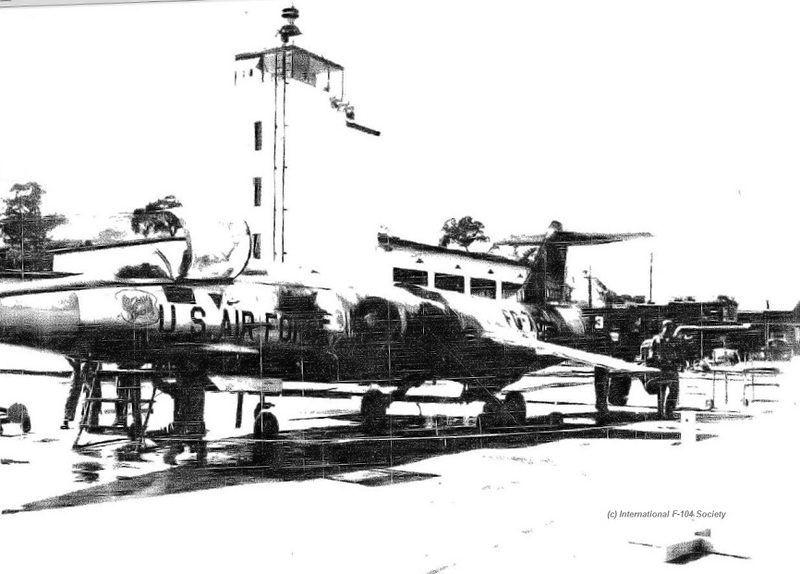 The aircraft was owned by AMC (Air Material Command). Officially it was still JF-104B. The flight was a continuation of the F-104B Spin Testing Program, the 30th test since starting the program. This flight, if successful, would have completed one of the demonstration maneuvers required by Air Force contract. The aircraft was prepared for flight by the regular ground crew on the morning of 30 June 1958. Total fuel on board was 643 gallons. The flight was properly cleared on Lockheed Aircraft Corporation Clearance Form 1264-10, which is used in lieu of Air Force Form 113. The weather at 0925PST was clear, visibility thirty-five (35) miles, wind West North West at 8 knots, temperature 80 degrees, dew point 34 degrees and altimeter setting was 29.89. 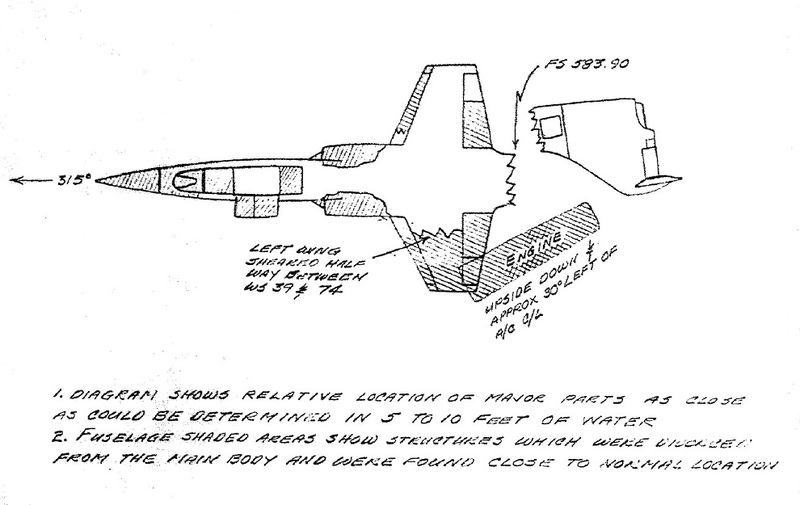 The JF-104B made a normal A/B take-off and climb to the rendezvous point at which time it was joined by an F-94C chase plane and the two aircraft preceeded to the spin point. At this point a 1-G pitch up with pro left spin controls was performed. The engine stalled during the spin entry and the engine was shut down.The spin was commenced at 39.000 feet and no transmissions were made after the entry until the spin was completed at 15.000 feet. Upon coming back on the air at 13.000 feet the JF-104B pilot said, "I think we are going to have to do something about this engine. It stalled again just like the other day". 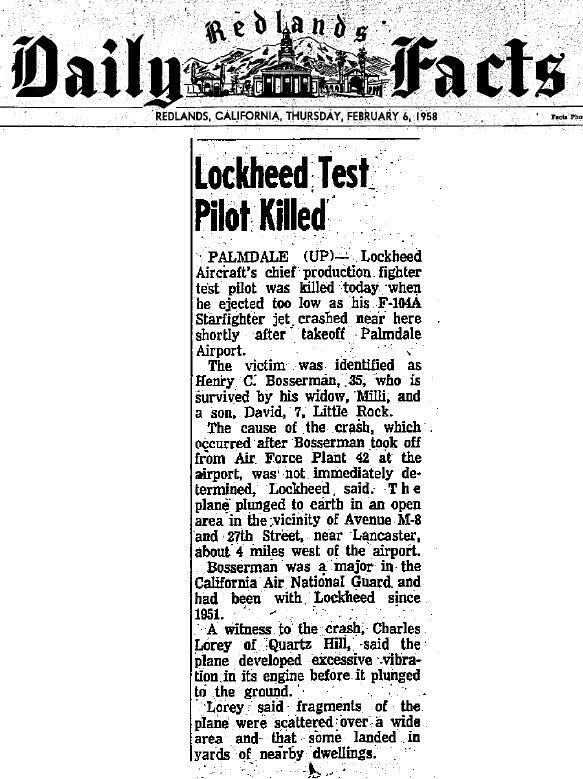 The pilot elected to discontinue his tests at this point and returned to Palmdale. During his flight home the pilot performed polarity checks without encountering any evident engine difficulties. A normal initial approach was conducted and a pitch out performed with the chase F-94C flying the right wing of the JF-104B and taking motion pictures throughout the pattern for publicity purposes. The pilot of the JF-104B gave a normal base leg gear check and continued his turn onto final. Sometime during this turn he suffered a loss of thrust and descended down and away from the F-94C. Shortly thereafter he rolled his wings level and retracted the landing gear. 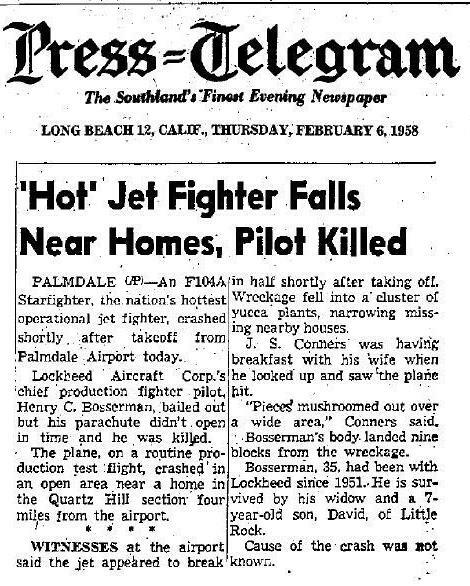 He struck the ground in a nose high tail low attitude and the aircraft disintegrated and burst into flames almost immediately after impact.The JF-104B crashed at 1019 PST, one and one half miles northeast of AF Plant 42. 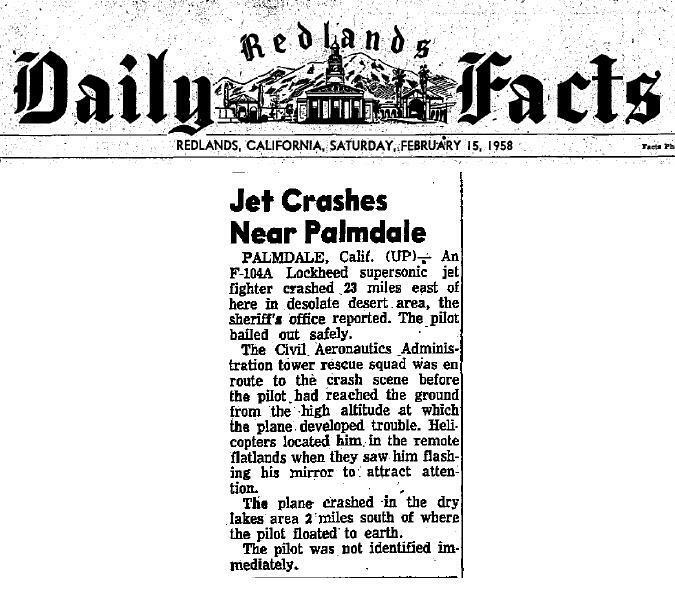 Throughout the flight the JF-104B pilot was in contact with either the Palmdale tower or Lockheed Aircraft Corporation's Company radio. At no time did the pilot declare an emergency or give an indication of aircraft airframe or engine malfunction other than the engine stall at spin entry. Lateron an investigation found out that the problems were caused by an open-nozzle issue (confirmed by Tony LeVier). The IFS owns a copy of the official accident report. An unknown RAF testpilot, while testing century fighters in the US, experienced a total loss of oil pressure immediately after take off with his F-104A. The fact that this was due to a poor electrical contact in the instrument only became apparent after he had scraped round a full power emergency circuit in pre stall buffet at about 220kts (253mph/406kmh) and had touched down at about 156kts (189mph/305kmh). Pilot was safe, aircraft was soon repaired. During a General Electric test flight the pilot experienced a fire. 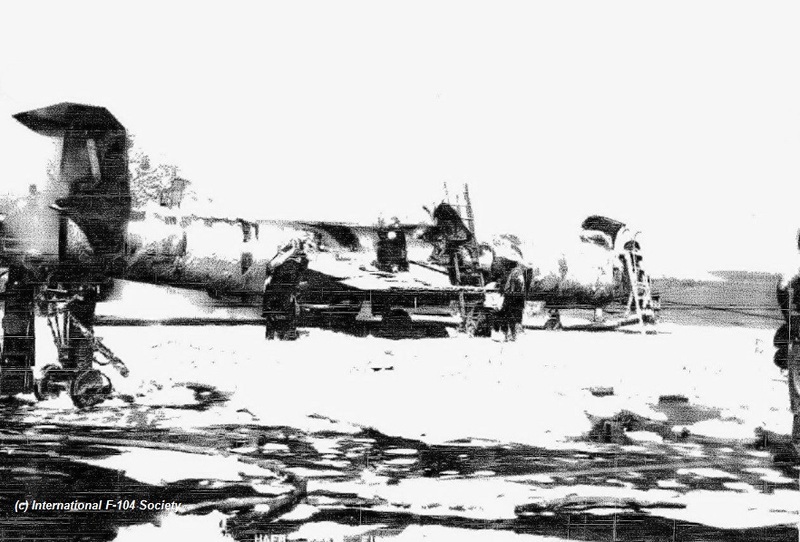 He was able to make a normal landing but the aircraft was partially destroyed by the fire. It was declared a write-off. 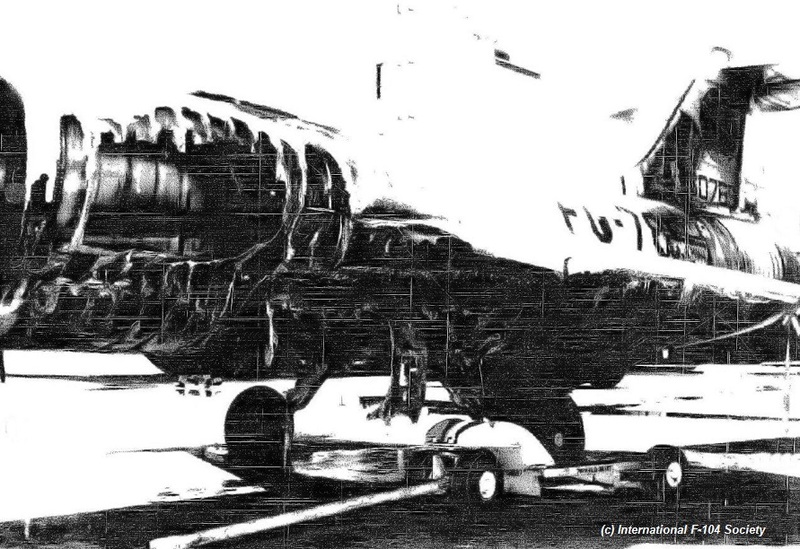 The air frame was scrapped at AFFTC a short time later, likely on September 26th, 1960. (Thanks to Jason Chapman, GE historian working for GE). 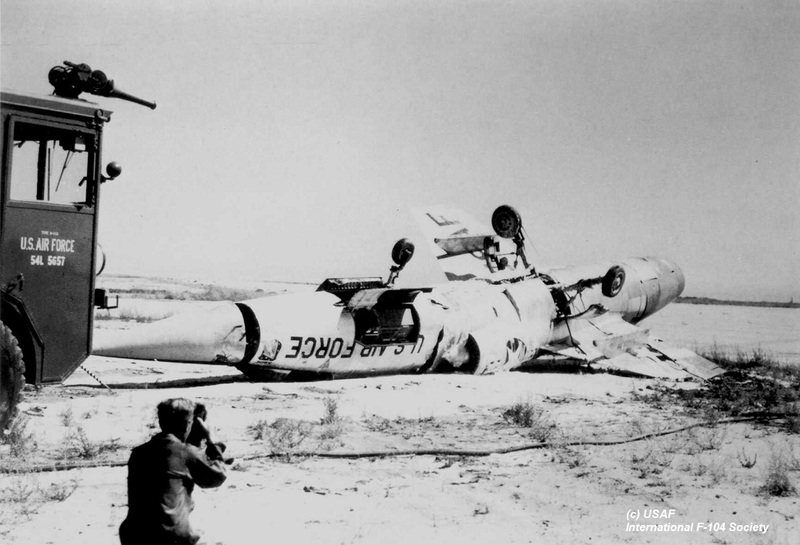 Written off after an accident on Edwards AFB, California. Capt. 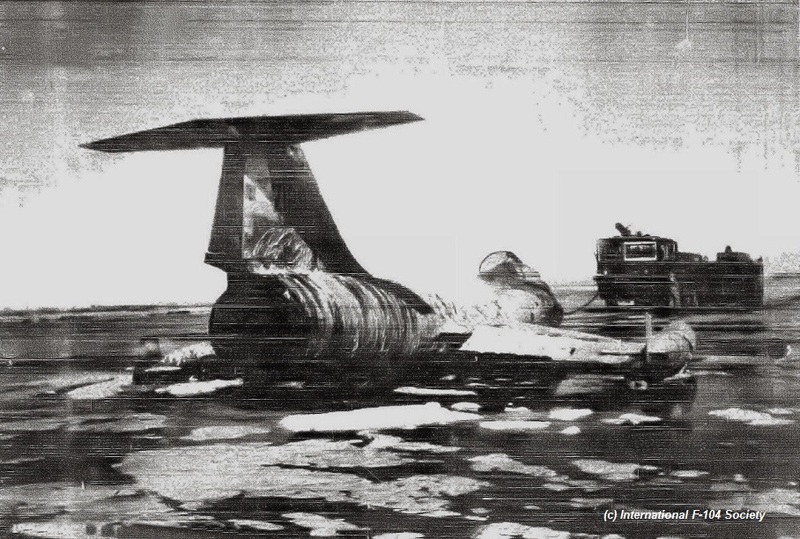 Ivan Carl Kincheloe Jr. whom the Air Force had assigned to fly the North American X-15 rocket research aircraft, was fatally injured in this crash. The aircraft crashed about 10 miles SW of the headquarters building at the Air Force Flight Test Centre (AFFTC). 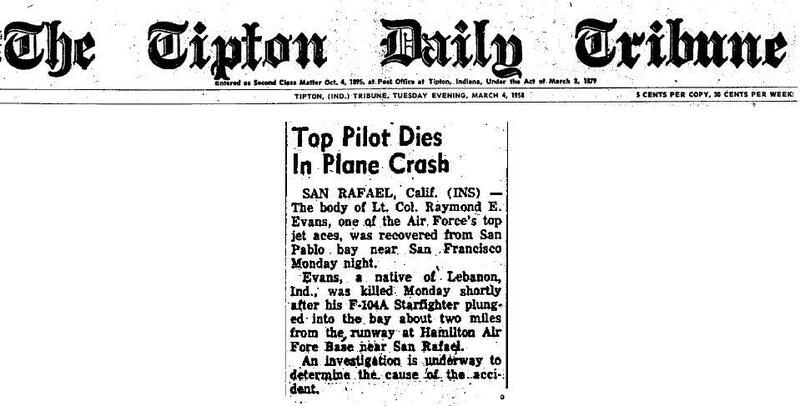 He was officially the 7th pilot fatally injured in F104A accidents in the USA. 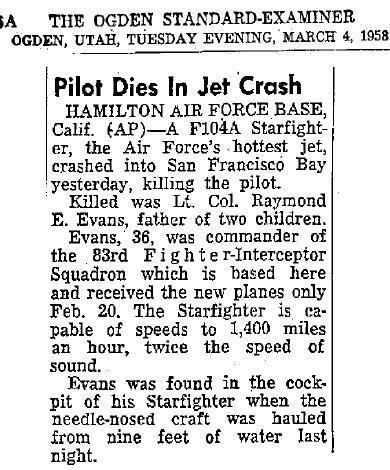 The pilot lost its engine just after takeoff at Edwards and he was too low to eject downward, so he tried to roll to inverted and fire the seat but he never made it around and out. Impact was 9.5 NM SW from the west end of Rwy 22A. He took off in a F-104 to fly chase for Lou Schaik (flying F-104A 56-735), a civilian test pilot for Lockheed. 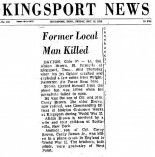 Kincheloe climbed to almost two thousand feet when suddenly the engine quit. 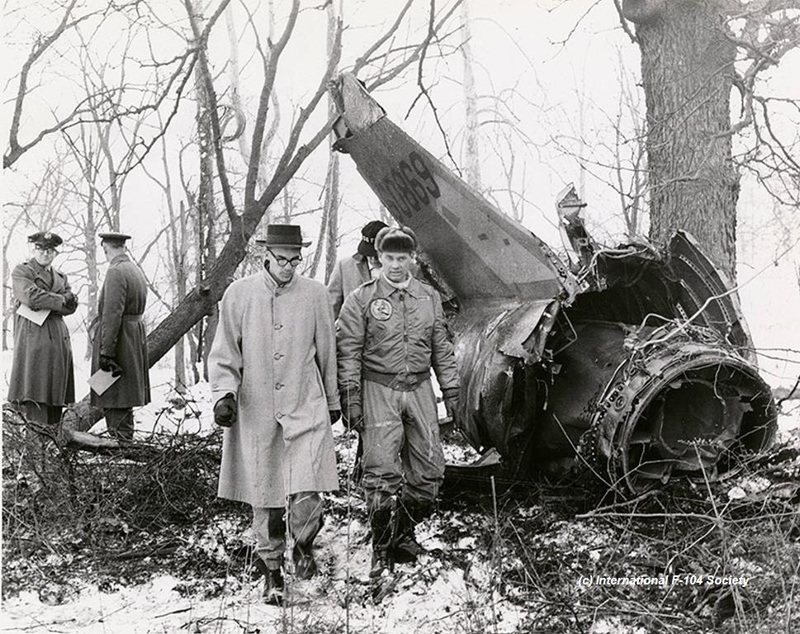 Immediately the plane began to fall, and Kincheloe was already too low to eject downward, while he still had control of the plane, he began to roll it over on its back, calling over the radio, "Edwards, Mayday Seven Seventy-two, bailing out." The plane was almost inverted when he ejected, his parachute still unfurling, followed into the flames and died. Captain Kincheloe, Jr. was buried with full military honors at Arlington National Cemetery August 1, 1958. On this day this F104 was burned beyond repair at Hamilton AFB and was written off. 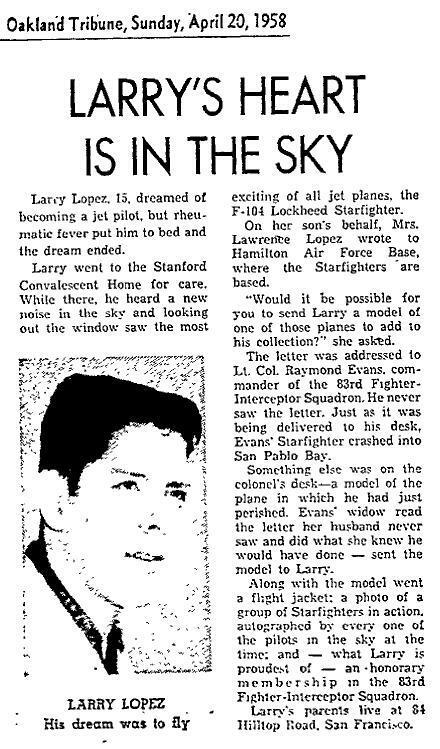 The pilot Capt Earl E. Yanecek was ok. It was cause due to a possible material failure in the starting unit of the aircraft. During the latter stages of a normal start, a muffled sound was heard, similar to a small explosion, and the aircraft was observed to be burning around the wheel wells. A major fire resulted and the F-104 was destroyed. Due to quick action on the part of the ground crew, other aircraft in the immediate vicinity were removed. The aircraft was scrapped, parts of it can be found inside the mockup aircraft found at March AFB. The IFS owns a copy of the official accident report. Photos beneath are obtained from the rough copies of the accident report. Sorry for the bad quality, although quite unique. While used as test aircraft in a barrier test project it was severly damaged during one of the many barrier tests at Edwards AFB where it flipped over. It was nicknamed “Slosher”. It could be repaired soon inside the production proces at Lockheed and continued the test program lateron. This aircraft, operated by 538th FiS crashed this day at Grant Moses Lake, Washington, 8 miles N of its homebase Larson AFB. After encountering an open nozzle problem in the air the pilot initiated an emergeny landing. This landing (flaring down with T/O flaps did not work out well at the end. The chute was selected too early and the aircraft came down very hard crushing the gear which was opening. Pilot selected power from military to idle and switched off the fuel. During the crash landing some fire ignited but the pilot could open the canopy and leave the aircraft in time. The crashcrew killed the fire instantly. Initially it was not written off and went to Lockheed AMC for repair. 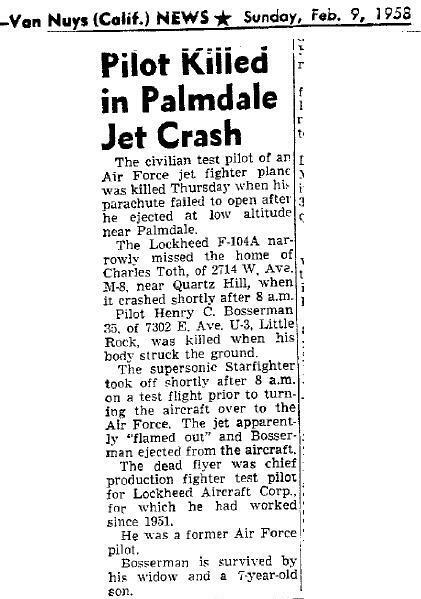 Pilot James Kenneth Rostermundt was ok. On 7 Febr 1959 it was declared damaged beyond economical repair at Lockheed AMC. It is unknown what happened to the airframe afterwards but likely it was used for spare parts. 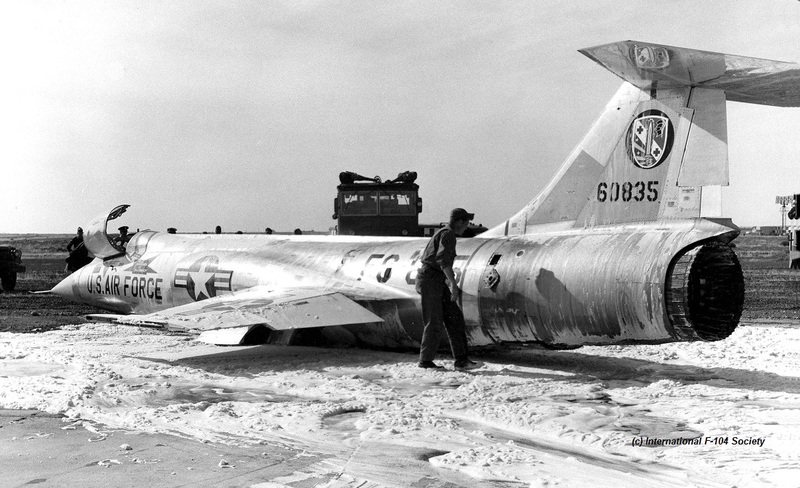 Written off after a crash on Wright Patterson AFB. It crashed 4 miles NW of Patterson Field. This aircraft took off as lead in flight of 2 ("Jazzbo Special Flight") on a morning IFR local scramble mission under GCI control ("ADC Scramble"). Purpose of the mission was to determine minimum intercept time on a T-33 target aircraft at 35,000' and 150 naut miles from point of take-off. Successful intercept was made in 9 minutes. After both aircraft made an intercept they were vectored back to base for landing. 3 miles out on initial the tower reported that an F-100 was conducting a taxi-test on the runway and requested Jazzbo Special flight to make a wide pattern until the runway was cleared. While initiating a go-around pilot LtCol Brown declared minimum fuel and requested closed traffic pattern for immediate landing. After go around and on base leg a "blurp" was heard by witnesses as the lead F-104 (LtCol Brown) passed the alert hangars at the approach end of the runway, and puffs of black & white smoke were seen coming from the tailpipe. Approx 3,500' down the runway the pilot turned right and declared an emergency. A second transmission was made which was cut-off or unreadable. 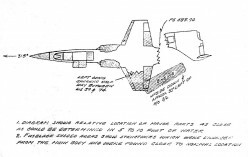 90 degrees into the turn, the aircraft rolled near wings level and the pilot ejected at approx 700'. His wingman observed that the seat did not tumble and that the pilot did not separate from the seat. 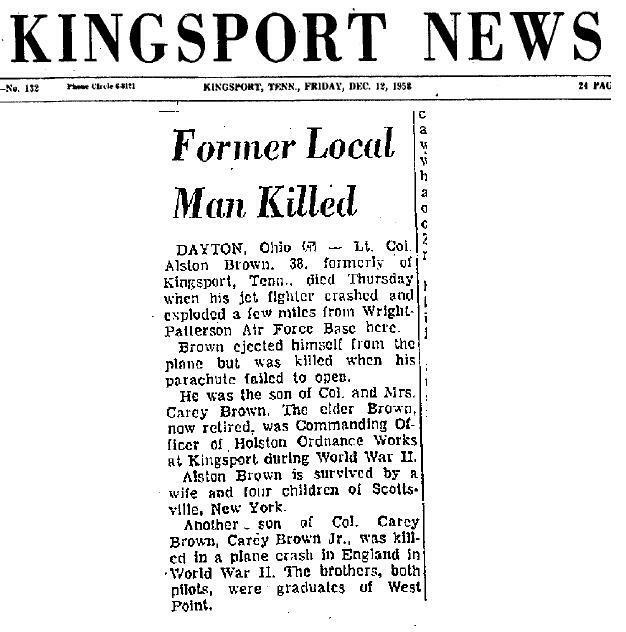 LtCol Alston Brown was sadly killed and the aircraft destroyed. The IFS owns a copy of the official accident report. 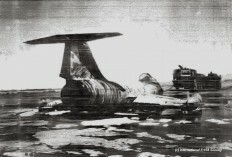 Beneath a photo showing the tail section of the aircraft after the crash, and a newspaper report thanks to Chris Baird. This two seater encountered an accident at Holloman AFB this day. The only pilot Capt. Thomas Uriel McElmurry was ok. He flew a maintenance testflight from Holloman with 1:30 hours fuel. At Mach 1.1 the pilot noticed hydraulic system #2 pressure fluctuating between 1000 and 2000 pounds. He decided to make a precautionary landing. However the gear failed and he had to lower them manually. This was ok for the main but not for the nosewheel. Nosewheel was out 10%. He decided after a few G manoevres to use the brake chute and with this force the nosewheel went forward and locked. Then during the landing the pilot experienced loss of control. System #2 pressure was almost gone. Via a long flat procedure he tried to land but the aircraft came down roughly bouncing hard, loosing eventually first nosewheel, then right wheel and left wheel. Then skidded over the runway, fueltanks both exploded due to the scratching heat. 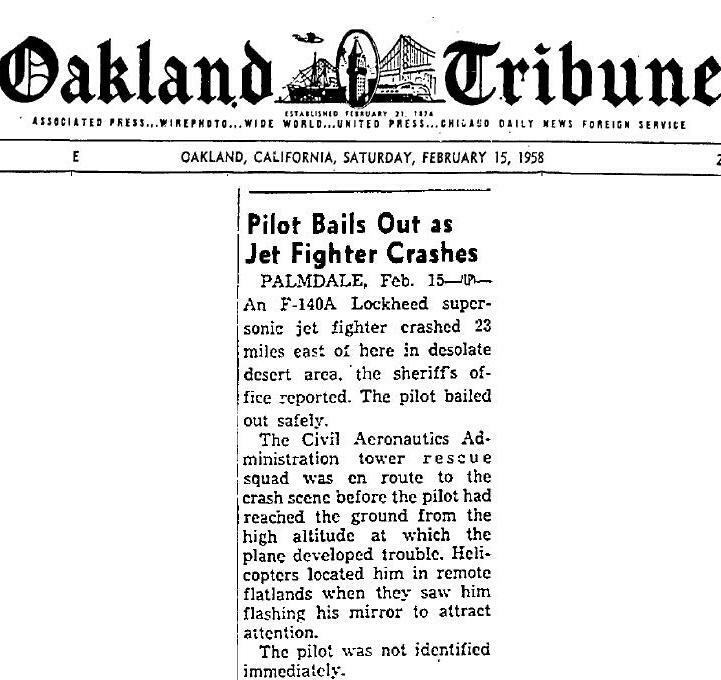 When stopped the pilot could step out unhurt and the groundcrew could stop the fire. It was first declared repairable damaged and was used as static test aircraft for a while. The aircraft status was changed from EH (test) to WR (crash damage) on 3rd February 1959 and it never turned to operational again. It went the rounds of maintenance units and then went to Davis Monthan for scrapping. Photos beneath are obtained from the rough copies of the accident report. Sorry for the bad quality, although quite unique.